Do you want this year's lawn to be your best ever? Get the greenest, most lush grass on the block with these five mowing tips from the experts at John Deere. 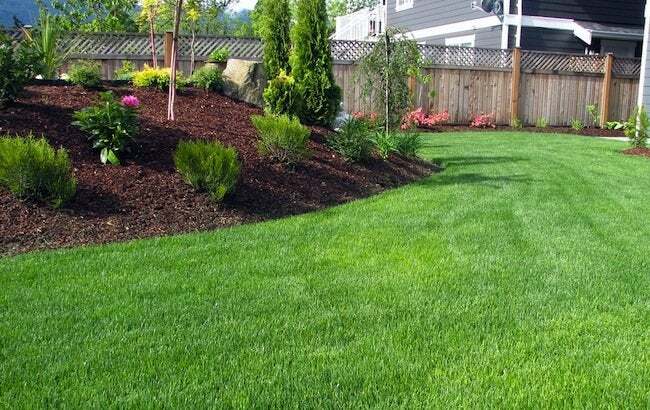 A green, good-looking lawn adds serious curb appeal and can even increase a home’s value. Thanks to major improvements in mowers in recent years, maintaining your own lawn is now easier than ever. We reached out to Mike Ballou, product manager at John Deere, to give us some pointers on keeping your yard looking its best. Not only does a sharp blade keep your mower running efficiently and reduce the amount of time you spend mowing, but it can also keep your lawn looking better. A dull blade can tug on your turf instead of gently trimming it. Take a look at your lawn next time you mow. If the ends of the grass look torn and ragged, it’s time to sharpen up. To sharpen the blade, you can take it to a professional or go the DIY route. To do it yourself, you’ll need a grinder—but remember: safety first! Make sure your lawn mower can’t start running while you’re working on it. Try pulling the spark plug or blocking the blade to reduce your risk while you remove the blade. When you’re grinding, keep the blade’s original angle intact and aim to get the blade only as sharp as a butter knife—any sharper could damage the blade. Unless you’re building a backyard golf course, don’t cut too much from the top of your grass—one-third off the top is the rule. If you cut too low, you risk damaging the crown of the grass, the structure that keeps your grass growing strong. Another benefit of keeping it high: Taller grass grows more slowly, which means less mowing for you. Every time you mow, vary the route you take across your lawn. Mowing repeatedly along the same route can cause wear on your lawn, making the grass grow in the same direction and eventually fall flat. Always traveling the same path takes a toll on your mower too, because making the same turns all the time can put unnecessary strain on one side of the mower. So try to take the scenic route next time. If, however, you’re working in a tight space or on a sloping hill, always opt for the safest mowing pattern. Small yard? A walk-behind mower should be right for you. If, however, your yard is larger than half an acre, a riding mower could make your life easier; it’s also a good bet for a hilly yard. If you have landscaping, trees, or garden paths to maneuver around, you’ll need to take the mower’s turning radius into consideration. If your lawn is dense or coarse, choose a lawn mower with high horsepower. Take care of the little things to extend the life of your mower. Grease and dirt buildup on a mower engine will make your motor run hotter, so after using the mower, wipe the area clean or spray it down with a hose. Keep the mower clear of old, dried grass clippings to prevent it from getting plugged. Change out the filter and oil regularly. To keep your mower in tip-top shape, store it properly and keep it out of the elements. Never leave gas in your mower over the winter—but come spring, if you left in some gas and the mower doesn’t start up for that first cutting, try draining the gas tank and starting fresh. 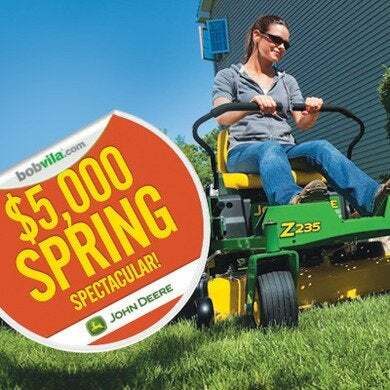 Enter Bob Vila’s $5,000 Spring Spectacular today and every day through Monday, March 31st (11:59 EST) for the chance to win a John Deere riding mower and custom garage storage.